FAT-BURNING SUPPLEMENTS – COOKING MEALS WITH POWER! Fat-burning supplements never got more delicious than this! And the best part, there are thousands of recipes flooding the internet that contain these weight loss containing ingredients! 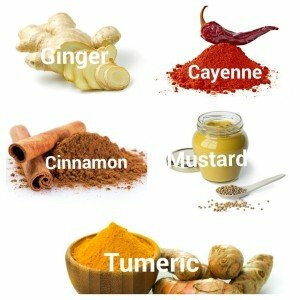 5 FAT BURNING SPICES THAT EVERYONE SHOULD USE! This little gem of a weight loss spice is one of my favorites! Mustard seeds have been show to boost metabolic rate by 25 percent. In fact, you may be able to burn an extra 45 calories per hour or an additional 500+ calories per day by eating just 3/5 teaspoon of mustard seeds daily. The second spice on our weight loss spice-list is ginger. Ginger may have thermogenic properties that help boost your metabolism. Even more so, ginger may have an appetite suppressant effect when consumed. Who wants to add a kick to their Sunday chili with this amazing weight loss spice! Cayenne pepper contains capsaicin, the compound that gives peppers their zing. Amazingly, this may help shrink fat tissue and lower blood fat levels. Cinnamon may boost your metabolic rate–the speed at which you burn fat and make energy. In addition, cinnamon has been found to significantly reduce blood sugar levels, triglycerides, LDL (bad) cholesterol and total cholesterol levels in people with type 2 diabetes. Turmeric may reduce the development of body fat by suppressing the development of blood vessels needed to create fat. What’s more, turmeric is also strongly anti-inflammatory and may indirectly reduce cortisol levels. Cortisol is a hormone that typically increases belly fat. Free Consultations with our Certified Nutritional Counselor! Fill out our Free Online Weight & Health Evaluation, call 770-304-1500 up until midnight any night or scroll to the bottom of the page and fill out the contact form and one of my amazing staff will help you ASAP!